The most comprehensive set available in UK today. 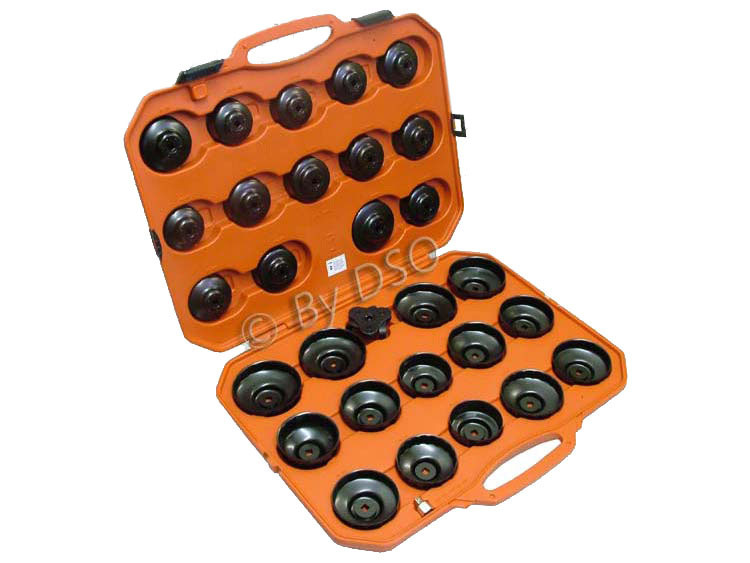 Extensive kit designed for a wide range of vehicles. Cap type filter wrenches, made from 7 and 16 gauge steel, will withstand up to 85lb.ft torque. Designed to grip like sockets, thereby minimising the possibility of crushed filters and reusable caps. Also included is an adjustable oil filter wrench. The adaptor allows use with 3/8" or 1/2" drive wrenches. Supplied in a tough purpose made blow moulded carry-case that enable you to put the caps back in their correct location every time. This item is brand new however the Inner part of the case is damaged so it is a great deal, not to be repeated. There is no returns policy on this item. Whilst extra care is taken during the packaging process, we cannot accept liability for damage that may be caused during transit. All products carrying this disclaimer are pre-checked and where necessary, added protection is introduced prior to packing and despatch. There is no warranty offered in these items. Get it before it's gone!